October 2014 – This is a blog. I write it. Baz Luhrmann’s Australia, was his next production after the hugely successful Moulin Rouge. 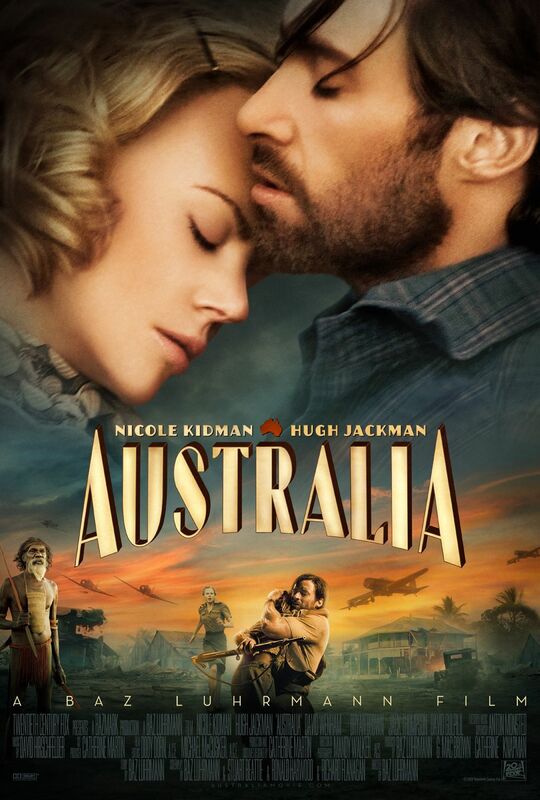 It even starred Nicole Kidman, though alongside fellow Australian actor Hugh Jackman. The film uses the tropes of oral storytelling and the bright colour palette of a children’s story. The narration is by a child and tells of the rich aboriginal culture that existed in Australia and the white-washing it received with the entry of the white Australians. The story is thus set on the experiences of the children of the Stolen Generations. The film is well shot and gripping in parts however, it fails in that one thing that makes a Baz Luhrmann film stand out and take the audience away – passion. The film lacked the overwhelming yet focused passion that made Romeo + Juliet and Moulin Rouge such great successes. Both these films seduced the viewer with the frenzied passion, romance and looming tragedy that made up their narrative. Agreed that Australia’s theme was ‘overcoming the odds’ but the focus slipped and sharpened in the flow of the narrative. Hence some of the adventurous moments take away from the crux of the film. It is a beautiful attempt by an Australian director to talk about the experiences of the Stolen Generation. What stood out is the characterisation that takes the story forward. Lady Sara (Nicole Kidman) is an aristocratic British lady, who comes to Australia to settle her husband’s affairs and starts a new life. She unlike others of her background believes that the ‘half-caste’ children should not be sent away. But somewhere to emphasise that we will bring some aspect of prejudices from an alien culture, she does not believe Nullah (Brandon Walters) should leave her and go on his walkabout with his grandfather because she possesses western notions of education and safety. Drover (Hugh Jackman) on the other hand, consciously chose a non-white tradition to identify with and is hence more understanding. It is about how far can you push aside your prejudices, doubts and accept people on their terms. After all, it is not uniformity that will knit us together, but acceptance. So watch the film for how Baz Luhrmann has made the Australia of multiple narratives stand out.